There are 27 festivals in our database from Wales this year. Welsh festivals are lively, and justifably famous for their singing. There aren't as many festivals in Wales as we'd like, but they are all great music festivals. The list has been updated for 2019, and we will update it regularly. Remember, we can't check every ticket price, unfortunately, as some are not listed until closer to the event, so we advise you to check the prices yourself. Click on a festival name and it expands to reveal the full details (like the first one). Not quite a folk festival, but includes traditional music. Revive this ancient tradition with the Mari Lwyd, Food, Music, Noise, Dance, Cider, Apples and plenty of laughter! Gower Wassail Festival will be a Gastronomic Wassail Festival event. Wassailing is an ancient Welsh tradition to promote a good apple harvest the following autumn. The Coppertown Mari Lwyd is also brought into the celebrations (welsh grey mare) there will also be a Torch Lit Parade with the Gower Old Horse! A one day afternoon - evening event. Hence the great value for money price! Includes morris Dancing and music throughout the event. A family festival of music, song & dance of the Celtic countries of Ireland, Scotland, Isle of Man, Cornwall, Brittany & Wales, with a packed programme of concerts, dances, workshops, street dance displays in the Town Centre and on the Esplanade on Saturday, our legendary sessions in the bar and Beach Ceilidh on Sunday! A warm-up for their event in July. The Wales Harp Festival offers an excellent opportunity to learn, participate and enjoy Harp music in one of the most beautiful regions of the UK where nature and historic architecture provide the best experiences for any tourist. Why not combine this opportunity to visit the harp festival with exploring our region? There will be concerts, competitions, master-classes, lectures, fun classes for absolute beginners, harp exhibitions and much more. Not a folk festival in the traditional sense, but as usual we like to include something a bit different. It is sold out each of the past 5 years in the beautiful Green Valley, Upper Cwmtwrch. So now looks to expand in a bigger green field area. The best of Celtic music over 3 days, with camping. The Welsh language music day being primarily the Friday evening. The best of IRISH SCOTTISH WELSH and CORNISH, BRITTON and ISLE OF MAN artists come together. Celebrating music from the Celtic nations. Now expanding into Foods, Drink and Arts and moving throughout the town centre and around the National Trust grounds of Dinefwr Castle Park, for the foreseeable future years. Also available Mainly free plus some individual event tickets. Set up originally as a showcase for traditional dance styles being learned and performed in South East Wales, the festival now celebrates national and international folk dance in all it's forms. Traditional music and song is also playing an increasingly important part in the festival. The festival is in it's 30th year. A mixed festival, at previous events there was a strong bias for folk music on the Friday. so take a look closer to the date to see if this happens this year. Workshops, Battle of the Bands, local brews, family entertainment. Fishguard's 20th Folk Festival brings together its unique mix of local talent and well-known performers to provide four days of songs, tunes and dance. Most events are still free, and whether you want to play, sing, dance or just watch and listen, there is always a choice of things to do in throughout this fun-packed friendly festival. Add in the beauty of the location on the world famous Pembrokeshire coast and you have the perfect weekend. Also available It's mostly FREE, 4 ticketed events. Spurred on by their love of folk music and outdoor activity, and seeing potential in a farm not used to it's full potential, 20 - 30 vounteers came together on the farm to begin the journey of a big tidy up and clear out. Through the efforts of countless volunteers and 5 festivals, we can safely say that our aims to renovate and maintain the farm have been a success. There is still work to be done, and still ideas to be brought to fruitition. It's an annual small gathering of the finest folk musicians in the world. Fabulous music every June on the stunning Gower peninsula. Tickets limited usually to 350 - 400, so get your soon. Look at their fabulous location! Also available A variety of Day tickets too. A 3 day festival for our global community with the stated objective as the expansion of consciousness from the material to the ethereal. Mixed genre, with a fair bit of acoustic and folk music. Check the line up to see if it suits you. Each year since 1947, over 4,000 performers from across the globe head to the beautiful little Welsh town to take part in a unique event combining competition, performance, and international peace and friendship. Around 25 different competitions celebrate song, music and dance, climaxing with the prestigious 'Choir of the World' where winning choirs compete for the Pavarotti Trophy. Bringing together a star studded group of acts who have graced the stage at individual concerts for two days of quality music. From small beginnings in 2013 the Folk on the Farm festival has quickly established itself as one of the highlights of the folk festival calendar, attracting hundreds each year and featuring some of the best folk artists from around the UK. Includes Quality Real Ale (from The Great Orme Brewery Company), Festival Food, Stalls, Fringe Festival in Cafe, Singarounds & Sessions. Folk on the Lawn, in various guises, as a modest little event, has been running for some years now. It is, perhaps, a little unusual in that it has no budget whatsoever and relies on the good will of those involved - artists, staff, the Abbey Mill Centre, the good folk of Tintern and various other benefactors and supporters, who lend the festival space, equipment, time and, not least, artistic prowess. Also available It's FREE ! Donations will be accepted. Deep in the heart of Wales, Rudry, population 1000, is the Rudry Music Festival. Two days of originalmusic and spoken word, for all ages.Features contemporary, alternative and traditional music artists, with food and real ale. Mixture of various media, incliding folk music, celebrating its 20th anniversary. With individual event tickets, you can choose your favourite artists to suit your taste in music and entertainment. The Fringe is a not-for-profit organisation run entirely by volunteers. As well as attracting visitors from all over the UK, the Fringe continues to grow its local following and is achieving its aim to become 'the festival for the town in the town' - thanks to everyone in our audience. A bit unusual for a folk music site - this is a folk dance event. With quite a variety of dance styles from a large number of locations and countries. I know some of you like this sirt of thing, so it's here. Site not fully updated yet, but things are progressing. Also know as the Blaenavon Dance Festival. Also available It's FREE ! Mixed genre event with something for everyone. Attracting visitors from all over the world, it is proud to be considered one of the longest running, largest and best free volunteer organised festivals in Europe. Music is the very essence of Monmouth Festival. We take great delight in showcasing an eclectic mix of iconic legends, local artists and up and coming young talent, dance, classical, country, folk, jazz, pop, rock n roll, ska, world music and so much more. Our aim is to enable everyone to enjoy a live music performance whether it is in the open air, in a church or pub; whether it is an old favourite, new or local talent, there is something to please everyone. The National Eisteddfod of Wales is one of the great festivals of the world, attracting over 160,000 visitors every year. An eclectic mixture of culture, music, visual arts and all kinds of activities for people of all ages, there's something for everyone on the Maes during the first week of August every year. The Eisteddfod is a travelling festival which belongs to the people of Wales. Site doesn't seem to like our pop-up box, so right click the link and select open in new tab. A large independant event, with a wide range of artists, and genres, more than 100 acts playing indie, psychedelia, Americana, and folk across 5 stages. Food stalls and a bar will be open in the evening. Many different themes. Supports the Bevan Foundation as well. An idyllic, new, 100 acre, woodland site in South Wales. Between The Trees has a unique theme of music, natural science and art. The festival aims to engage people of all ages with the natural world and to re-connect younger generations with the wonder and restorative qualities that this woodland environment offers. Musically, it is grounded in contemporary folk, Americana and acoustic roots genres, blending new exciting talent with more established performers; the music is wholly original and always wonderful. A small event, so don't leave it to late to get your tickets. This is the fifth time it's taken place, includes a crafts fair, ceilidh, sing-arounds and all the usual things. A small village of 36 houses, but they can run an festival! With an interesting line-up. The Fiddle Festival grew from the Welsh Celtic Fiddle Workshop Weekend, which began in 2005 as part of the Pembroke Festival, to accompany the Welsh Celtic Fiddle Competition. 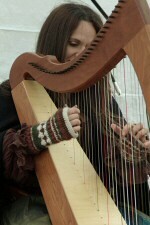 In 2006, the event began to be talked about as a festival, and in 2007 it became the inaugural Fiddle Festival of Wales. Held at the National Trust Stackpole Centre until 2010, the event attracted international tutors and fiddlers from many walks of life, for a wonderful weekend of music-making. The Tenby Blues Festival has grown rapidly and is now firmly established as one of the major events in the UK Blues calendar. This intimate and friendly festival has built its reputation on the strength of its line up that just gets better by the year. This year is the event's 14th birthday - a teenager now. The festivals below are from last year which, at the time of our last check, had not yet updated their websites to 2019. This helps you check up on festivals we haven't yet confirmed are on this year. If you see any that HAVE recently updated to this year, let us know (email is given on the Contact page). And if we've missed a festival completely, do tell us. This year for the first time we will be holding an Easter Warm up festival from the 30th and 31st of March 2018 at Tyddyn Mon farm. A small group go walking and then make music. Not realy a festival but wil suit some people. A fantastic walking weekend with a musical difference. Two days of guided walks, good food and excellent company plus an open mic acoustic music night. Bring along your Guitar, Banjo, Mandolin, Ukulele or if you're not a performer just your best listening ears and enjoy a relaxed weekend of walking and foot tapping entertainment. Places include 2 days guided walks, an acoustic music evening, accommodation and meals. Takes place in May and in November (see their availability tab). An evening of folk music. Llandeilo is an important hub for all things creative with events celebrating the arts including festivals of Literature, Jazz and Classical music. Folk @ The Hangout is set to be a vibrant evening of music to add to the variety of creativity Llandeilo has to offer. It is the brainchild of l ocal folk band The Meadows, who toured theatres and concert venues across Great Britain in 2017 with their highly-acclaimed original show Celtic Journey alongside Maine Celtic music star Krystyn Murphy. Picking all weekend, slow & fast jams. Workshops, Young musicians stage spots, Open Mike, Scratch bands, 3 Groups Sat afternoon, Camping, Gospel session Sunday morning. Dogs allowed.24 hr toilets & Shower. Good food and beers, free entry to animal farm and owl sanctuary. Fabulous North Wales welcome. For the serious musicians who want to just play, for the those that want to learn how to play, Is for young musicians who the future of live music depends on. Music, arts and culture, experiences and activities. THere are a variaty of genres of music here, so again, it's one you should inspect then decide upon. Festival No.6 is the UK�s most unique experience. A multi award-winning music, arts and culture festival, located in our magical coastal home of Portmeirion, with an eclectic mix of iconic and the best new artists. Member of a folk music club? Then help your fellow folk fans by placing a link to our site on your club's website, thus spreading the news about festivals in the UK to more folk music enthusiasts.